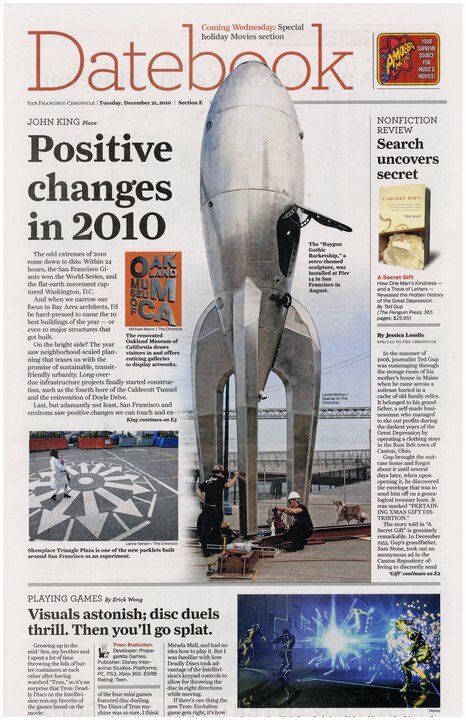 As the year comes to a close, the Black Rock Arts Foundation was pleased to be included with the Raygun Gothic Rocketship in the San Francisco Chronicle’s Datebook piece on “Positive Changes around San Francisco and it’s Environs in 2010”. 2010 saw many great achievements for BRAF that you can read about here in our blog and at The Black Rock Arts Foundation. Because of the support of folks like you, we were able to ensure that art and community building continue to serve as tools for civic engagement around the globe. We know that art can build community and bring people together, and we believe that all communities deserve art. More than ever, we are encouraged by our recent successes and invigorated to expand our programs and extend our reach into more communities worldwide. 2011 is already shaping up to be a banner BRAF year. We have been awarded our first-ever grant from the National Endowment for the Arts. An N.E.A. grant of $10,000 kicks off our newest endeavor, a Civic Arts project we’re calling The Bike Bridge. In January of 2011, BRAF begins a yearlong project in Oakland, CA, collaborating with young people, with qualified artists, and with local partner organizations to create a gateway sculpture made of reclaimed bike parts. As a work of art, The Bike Bridge will be the gateway to the City of Oakland’s new Uptown Merritt Art Park, to be located adjacent to the Fox Theater. This new art park was also recently awarded $200,000 by the National Endowment for the Arts, and will feature temporary exhibitions of large-scale works of art. We are continually grateful for the extraordinary support and investment of our community. You and other supporters share BRAF’s vision of bringing people together and creating positive change through art. The Bike Bridge is testament to the evolution of our programs, and the broadening of our ventures. Because of your support, BRAF continues to pioneer new modalities of public art. We hope that those of you who were able to participate in the activities of the three BRAF programs in 2010, or even in the festivities of our annual ARTumnal Gathering, will agree that BRAF has made great progress in bringing the Burning Man ethos of art, interaction, and community “to the rest of the world, the other 51 weeks of the year.” But, we need your help to continue to fund, support and enable community-building, civic-minded, interactive arts projects and expand our reach to new regions. It is your donations that sustain us. Please consider showing your support once again by making an end-of-year contribution, so that we may bring even more innovative, interactive and community-building projects to cities worldwide in 2011.